Ear infections are a common and painful experience for dogs and puppies. Because of the long, saggy nature of most dogs’ ears, it makes them really prone to holding developing bacteria around those areas. Most dogs will experience an ear infection at some point in their lives, and yes they are painful for them, but the good news is that most of them are not serious and can be treated and prevented with some fairly simple and natural methods. Ear infections in puppies can be caused by mites, whereas ear infections in dogs are mostly caused by yeast and bacterial buildup. If you are worried that your dog may have an ear infection, here are some easy ways that you can spot it. Usually your dog will scratching or rubbing its ears, or shaking its head, exhibiting signs of irritation. You may also notice a strange and unpleasant smell coming from the ears, or see that they are swollen and/or red. If your dog is showing these common signs for an ear infection, you can take your dog to the veterinarian so that they can examine your pet’s ears more closely. 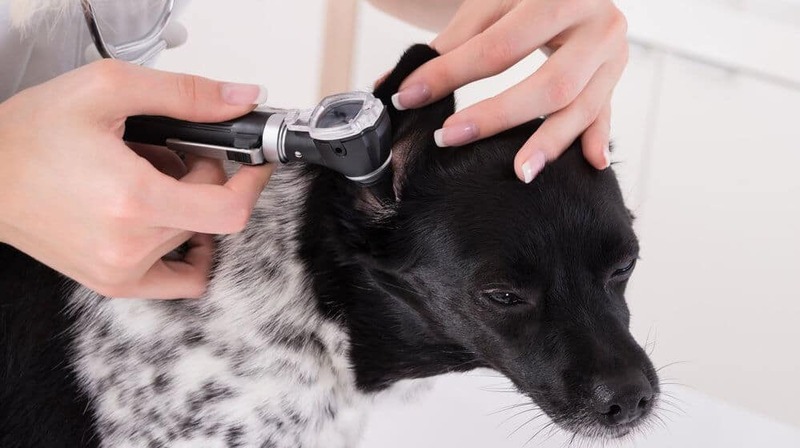 The great news is that if you believe that your pet has an ear infection, you don’t have to worry about running your dog off to the emergency vet clinic immediately. There are some natural ways that you can start treating your dog’s ear infection to see if symptoms improve. Here are a few different, natural ways that you can treat your dog’s ear infection. If symptoms do not improve after treating your dog with the following methods for a few days, please take them into your vet as soon as possible. They will be able to further analyze your dog to diagnose the infection, and give you the appropriate antibiotics to treat it. Warm compresses are a great way to treat your dog’s outer ear infection. It can really help treat the irritation, inflammation, itchiness, and redness of the ear. All you have to do is soak a washcloth in warm water, squeeze out any excess water in the rage, and press the damp rag against your dog’s ear. This treatment works best when you use it several times a day. Repeat this method until your dog’s symptoms improve. Apple cider vinegar can be an awesome preventative measure for ear infections, as well as an awesome treatment for them. For prevention, have your dog drink two tablespoons of apple cider vinegar in a cup of water daily. For treatment of an ear infection, dab a cotton ball in apple cider vinegar (not a cotton swab) and gently apply the apple cider vinegar to the affected area. Vitamin E oil is a great treatment method for curing your dog’s ear infection. You can either get pure vitamin E oil and use an applicator to apply two drops to your dog’s ear, or you can crush up a vitamin E capsule and use the oil from that to put in your dog’s ear. This is a great method for helping cure your dog’s ear infection. Make sure that you have a fairly high vinegar to water ratio, so that the vinegar will soak up any excess water that makes it into the ear. Combine water and white vinegar together. Use a cotton ball to dab the solution onto your dog’s ear around the infection. Almond oil is an awesome preventative measure that you can use to reduce the risk of your dog getting an ear infection. All you have to do is take ½-1 teaspoon of almond oil in each ear. The almond oil will keep the ear lubricated and loosen any wax or dirt that gets caught in their ears. Aloe vera gel is another great way to treat itchiness, irritation, reduce inflammation, and help fight the infection. All you have to do is heat a little aloe vera gel, and add about a tablespoon of the heated gel to each of your dog’s ears. Repeat this process daily until symptoms improve. Now you have some great, reliable, and natural remedies for treating your dog’s ear infection. The next time your dog has an ear infection, give one or a couple of these methods a try.If you use any of these methods consistently for more than a few days and your dog’s symptoms don’t improve, you should set up an appointment with your veterinarian immediately. Your vet will be able to better assess the nature of the ear infection, and provide the proper antibiotics for treatment. Did you enjoy this article? If you did, share it with a friend. If you have any questions or comments, feel free to leave them in the comment section below.